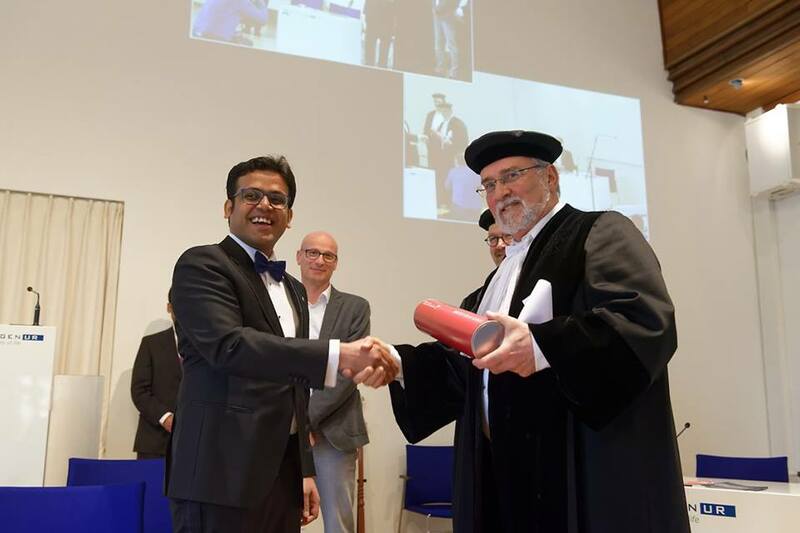 Soutrik Basu successfully defended his dissertation on Knowledge production, Agriculture and Commons. The discourse on knowledge production is in constant transformation: on the one hand, there is the emergence of instrumental knowledge production based on scientific utility and socio-economic relevance and marked by property regimes, while on the other hand, there is another form of knowledge production based on cooperation, communication and the sharing of knowledge often entitled the open-source production or commons-based peer production (CBPP) mode. Both these trends are reflected partially or in full measure within the agrarian knowledge production programme called Generation Challenge Programme (GCP). Created by the Consultative Group of International Agricultural Research (CGIAR), the GCP is an international knowledge production platform that aims to use plant genetic diversity to develop technologies to support plant breeders in developing countries. In this work, it employs advanced genomic science and comparative biology in order to develop improved plant varieties for harsh, drought-prone environments. It focuses both on conducting advanced upstream researches with the help of genomics, molecular biology and bioinformatics and also on facilitating the downstream delivery of this research result to the farmers’ field. GCP’s knowledge production is organised in an international network that consists of CGIAR research centres, National Agricultural Research Systems (NARS) institutes, Advanced Research Institutes (ARIs) and other developmental organisations. The overall framework of GCP’s knowledge production is embedded in a global public goods framework, although the GCP also uses open source software to share knowledge regarding different biotechnological tools that usually comes within the purview of intellectual property rights (IPR). Clearly, GCP’s knowledge production is mediated through a variety of patterns that may compete as fundamentally contradictory. 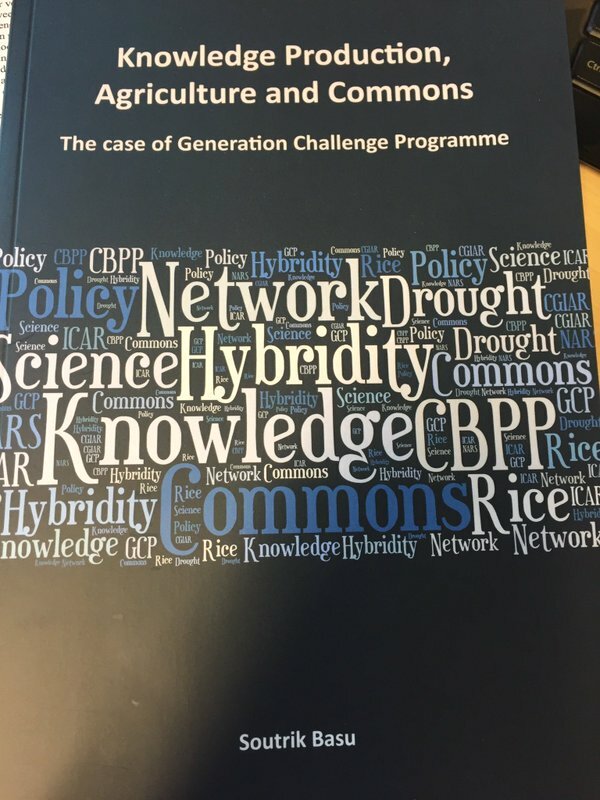 It becomes important to study the knowledge production process of GCP, therefore, so as to understand the type of knowledge production that has emerged there and the implications of this for the wider debates on agrarian knowledge production. Three theoretical concepts are employed to frame analysis of the knowledge production of the GCP in this thesis: instrumental and non-instrumental discourse, CBPP and commons. And to this end, drought-tolerant rice research in the Indian context is used as a case study. It is concluded that although this rice research community is situated in an overlapping institutional sphere of state, business and international institutions, it is itself neither public nor private in nature. This research community cannot be demarcated as a legal entity or identified through the state vocabulary. It exists as a confluence of plural activities through collective action towards a common goal, and it can be seen as a shared enterprise in which shared action generated the process through which the unpatented or otherwise owned Sahbhagi Dhan variety was developed and from which simultaneously actors benefited through participating in that shared process. Thus, the product that comes out from this process is neither public nor private in nature, but it is a common. It has been developed through shared action, as a process of commoning, and no single institution can claim exclusive right over it. Therefore, the non-state and non-market character of the research community becomes an essential feature. This entry was posted in General by Joost Jongerden. Bookmark the permalink.